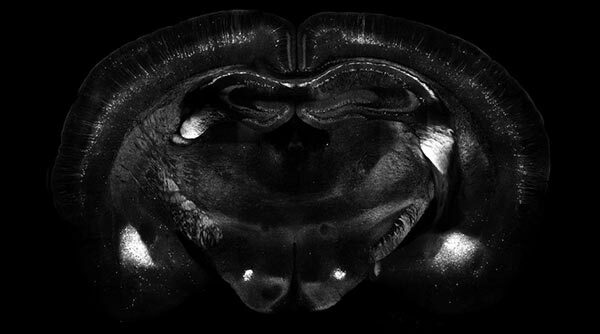 Thousands of smaller images are stitched together to create a single, highly detailed slice of a mouse brain. In the world of neuroscientist Denise Ramirez, Ph.D. (B.S. ’03), minds are a terrible thing to waste — literally. In this case, the brains in question belong to mice and rats. Ramirez spends her days researching the brains of rodents, trying to better understand how they work. 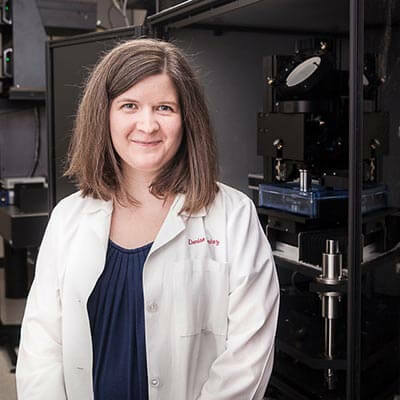 And while the brains she examines are very small, the equipment she uses at the University of Texas Southwestern Medical Center’s new Whole Brain Microscopy Facility is powerful enough to explore the inner-workings of tiny cranial matter. Enter the TissueCyte 1000, a rare (read: expensive) type of microscope that produces automated high-resolution imaging and 3-D reconstruction of entire rodent brains in about 18 hours, “many times faster and more accurately than previous methods,” Ramirez said. The Whole Brain Microscopy Facility, where Ramirez is the core facility manager, recently acquired two of these unique and advanced microscopes, which are the only two in Texas and among few in existence worldwide. From data the microscopes provide, scientists can “easily see neuronal connections that extend throughout the brain in three dimensions, and how they are altered by injury and disease,” Ramirez said. And although these are mouse brains, the research goal is to better understand how trauma affects the human brain. The Whole Brain Microscopy Facility is expected to be a major resource for scientists researching traumatic brain injury and neurodegenerative diseases such as ALS, Alzheimer’s, Parkinson’s and Huntington’s. “We aim to promote the discovery of efficacious treatments and preventive measures for brain injury by virtue of our unique ability to assess long-range neuronal connectivity changes,” Ramirez said. In turn, her facility will share terabytes of data with other researchers and institutions, with the goal of making significant contributions to medical research. Ramirez credited her St. Mary’s mentors, including the late Jose Miguel Cimadevilla, Ph.D., who was her undergraduate adviser at St. Mary’s, for helping her obtain quality summer research internships that led to her successful career in science.